The shadows of the Sixth World have every kind of danger you can imagine. Ultra-violent gangers, flesh-eating ghouls, mages that summon spirits from toxic waste, backstabbing corporate raiders, hard-nosed police officers, and even dragons. You don’t have much—mainly your guts, your wits, and your friends. But maybe that’s enough. Between you and your teammates, you can sling spells, hack the Matrix, talk a tiger out of his stripes, and bring down a charging ork from a hundred yards away. Will that be enough to face down the worst the mean streets can throw at you? You’re about to find out. Shadowrun: Crossfire is a deck-building game in one of the most popular game settings of all time. Crossing cyberpunk with fantasy and plunging players into a world dominated by ruthless megacorporations, Crossfire gives players the chance to dive into the world’s shadows to see if they can survive. They’ll have weapons, spells, contacts, and gear to help them out, and they’re going to need those resources. If they play their cards right, though, they’ll do more than survive—they’ll become legends. Fun Factor: So to start I am going to say that my group isn’t a storytelling group really at all. We don’t read the fluff blurbs on cards we just add up the math and try to win when playing games. So this game was a fair amount of fun, I am a big shadowrun fan and this felt like shadowrun for the most part. However, because my group doesn’t do the storytelling part I do feel like there is something about this game that we missed out on. My score reflects my personal time with the game but I do think that if your group really gets into explaining how every card matches the last and enjoys role playing your character while in a board game, that this would be even better for you. My biggest issue with the gameplay for this game is that there is a large luck factor happening when you play. We played a match where we started part 2 of the mission and every single bad guy did 2 damage and had 5+ levels of damage to get through. We quickly found that we were not even going to be able to escape the mission at all and simply had to restart. You may have noticed in my previous reviews that I don’t tend to enjoy large random elements too much. It wasn’t horrible here but it does hurt. Replay Value: This game has quite a few options for each playthrough of a mission. There are plenty of different cards to choose from for the deck building and many different challenges that can happen during a playthrough. Sadly the game box only comes with 3 missions, I find this to be very lacking personally. I don’t think that in a storytelling sort of game that 3 missions is nearly enough. Saying that I can redo those missions and every time it will play a little different isn’t really enough for me. For me this heavily drops the games value in total. Components: Everything in this game is well made. The box easily fits everything and while I would love if the game had come with a better way of storing the cards, maybe tuckboxes or some such, the box is at least large enough to support any sort of organizing you may wish to do. The cards look and feel just fine to me. I do need to mention the “legacy” style of this game, there are stickers and they are not removable. These will permanently alter the game as you use them. However, the game comes with some many different “race” cards (these are the ones marked by the stickers) that I do not think it will ever be a problem at all. I actually think it’s quite fun to put a sticker on there and know that you have permanently altered a character. Learning Curve: This game takes no time at all to learn. Each turn is pretty simple and the things that happen are very clear. I have no complaints here at all. Verdict: I really enjoyed playing this game, however I simply cannot recommend it at this point. It just does not have enough replay value, going through the game mission over and over in a story driven game is not very fun no matter how many different cards there are. This game needed to at minimum double the amount of mission cards that came with the game. When more missions are available, I would highly recommend playing it. As a final note: sorry for the delay in getting this out there. Had a busy week with PAX and didn’t have time. I should be back on track now. Shadowrun: Crossfire is a cooperative deck-building card game for 2-4 players set in a near-future fictional universe within the genre of cyberpunk and fantasy. Shadowrun, has since the first release in 1989, been one of the most popular RPG on the market, and Shadowrun: Crossfire was released same time as it’s RPGs 5th edition. In Shadowrun: Crossfire the players take the roles of the Decker (technology/hacking), the Face (charm/lies), the Mage and the Street Samurai; each have their own starting deck (consisting of 7 cards) that during the game will grow as you buy new and better cards. You will also choose between the 5 races (metatypes), human, elf, ork, dwarf and troll, which all have different starting hand size, hit points and starting nuyen (money). Before you start you will have to choose between the 3 missions that are included in this base set. Then you will draw an Obstacle card for each of the players (if your mission don’t tell you otherwise), and place them in front of the players. You are now ready to start! Play as many cards as you like and apply their effects (if any). Apply damage (and other effects) to the obstacles facing you or the other runners. Take damage from obstacles facing you. If you have 3 or less cards in your hand, draw 2 cards and buy as many cards as you like from the Black Market (six face up cards by default) paying their cost. Solve end turn effects if there are any. These cards state an event happening the current round, and can be good, bad or both, but mostly bad; Obstacles deal more damage, one or more players take damage or discard cards, Obstacles heal, etc. When a round is over, the current Crossfire Event card is discarded to a discard pool if there still are unsolved Obstacles in play. If all Obstacles are defeated, you don’t discard it, but put it on the bottom of the Crossfire Event deck. Crossfire Event card have a main event and one of more secondary events decided by how many cards in the Crossfire Event discard pool (thresholds). Divided into 2 difficulties where 1 is the easiest and 2 the harder. Obstacles are encounters with Scrybot Tracers, human bandits, trolls, dwarfs etc. Each Obstacle consists of a damage track, type/color, reward (nuyen), card ability and attack strength. When you flip the first Obstacle in each scene (a mission often consist of more than one scene), place the Obstacle in front of the player with the corresponding color of the Obstacle. Then continue clockwise. When all Obstacles are dealt, apply any of the Flipped-abilities of the card if any. Damage track – the order of attack you have to deal to overcome the Obstacle. There are a large variety of these like for example 5->mask(red)->spell(blue)->2->tech(green). In this example you have to deal 5 of any type of damage to overcome the first “level” of the Obstacle. Then a mask (red; tied to the Face role), spell (blue; tied to the Mage role), 2 of any damage and lastly tech (green; tied to the Decker role). Any character can buy and have any one of these damage types in their deck! When an Obstacle is defeated, you gain the reward (nuyen) as listed on the card. If you don’t manage to defeat an Obstacle on your turn, receive damage as described on the Obstacle card (1 or 2). These are the cards you can buy during Draw and buy step. There are 6 cards on the table, but you can modify this as you level up. There are 4 types of cards; one for each of the 4 roles in the game, but you don’t have to buy the one fitting your role. You better get some variety to be able to defeat all Obstacles as quickly as you can. Some of these cards have certain effects like heal, cancel attack, buy cards outside of the Draw and buy step and move Obstacles from players to other. Pluss most of them deal more than only one damage, which is the case of the basic cards you have in your staring deck. In addition there are cards with support abilities that you can play on other players turns. When you lose all hit points you get the Staggered condition. You shuffle all your cards (hand, deck and discard) and draw 1 card. You can still act as normal aside from buying new cards for the Black Market. You can be healed allowing you to draw two cards, and thus buy cards from the Black Market again. If you receive damage in Staggered condition, you become Critical and the mission is failed! But, your immediately begins playing the Abort Run. They have to survive one run and you’ll all get partial reward. If you win a mission you are rewarded Karma (xp). Karma can be used to buy upgrades that will permanently modify your character. There is on upper limit for how many Karma points you can have, but you can only have a total of 4 upgrades. Cost ranges from 5-50 Karma points and can be switched out. Upgrades are stickers that you place on your character. The components of this game are great. The card board pieces are of high quality, the art makes the theme come out and the mechanics are just awesome! Think of this like a puzzle where you have to work as a team to stand a chance at all; the game is unforgiving! I’ve only tried this solo (playing 2 characters) to learn the rules. Out of a total of 9 tries (the starter mission only) I have won 2 times! Solo play this way works ok, but it’s obvious that the game really shines with 4 players! Excellent replayability even with only 3 missions in the base set due to the variety of cards (none of either the Crossfire Events or Obstacles are the same) + mission expansions are coming. I’ve seen it discussed as some don’t like the idea of writing name and Karma points + putting stickers on the character sheets. I don’t see this problem as you can always buy more (the upcoming character expansion consist of more characters (not new ones, but new art) + more stickers) OR use stick notes. Being a fan of the Shadowrun universe, i was instantly attracted to the game during a convention and i was not sorry for it. The game is beautiful and rich, but also hard and demanding, even with 4 good players around the table the odds of getting a run complete with success are not that high, due to the luck factor. But with persistence comes character development and this makes the game interesting and adds a nice replay value to it, you keep adding karma points and leveling a character, giving a little edge on the next missions. 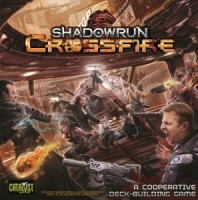 Add a Review for "Shadowrun: Crossfire"